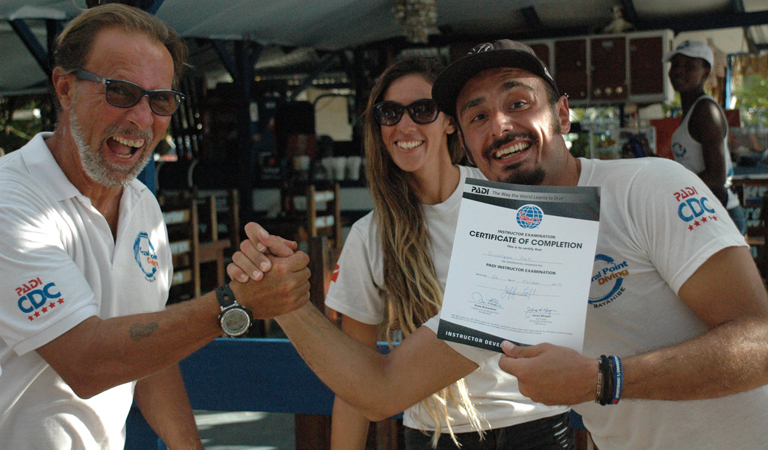 PADI Divemaster internship training develops your leadership abilities, qualifying you to supervise dive activities and assist PADI instructors with student divers. A Coral Point Diving Internship gives you more than just a normal Divemaster course; we strive to make you employable! The other focus of our Divemaster internship program is to make your PADI Instructor Development Course IDC an absolute breeze. A benefit to working in a dive shop like Coral Point is that you ultimately gain more working knowledge by being in and around the sport that you will later guide. Like an intern, your first day working in a shop, you will begin your path to becoming that all-around professional that can be much more desired for later employment because your understanding of gear, guests, local critters and conditions will be much more complete. At the Coral Point Diving we have stripped out all but the basics to enable you to change your life and the lives of others forever at a cost most can afford. It depends much on your actual level of certification and you will find what is more suitable for you on the chart below. Ayone can enroll into our professional programs as you see from our prerequisites section..
To become Divemaster check on the chart below to see what your actual certification is. On the second row you will find the cost, in US$, to become a PADI Divemaster. Coral Point Diving’s PADI Instructor Internship course program conducted in Bayahibe offers you an all inclusive training program, tailored to your personal needs and timeframe. There will be no role-playing throughout your Internship; you will gain firsthand experience working with real paying customers in our busy PADI Dive Centre. Dominican Republic is a very easy place in which to be employed. We can offer assistance in finding a job on the Island or in the whole Caribbean. We also sometimes employ our candidates; youneed to have a very good customer service oriented attitude, and good management skills. VISA is not a problem in the DR and you can renew it easily. You should arrive on a tourist VISA. Why should you choose Dominican Republic to do your training in the Caribbean? In the Dominican Republic dive centers and resorts are becoming well established and common. There are roughly 44 established diving facilities on the Island, however, the Dominican Republic can still be identified as a developing market for the diving industries. A VISA is easy to obtai, and our interns DO NOT face the same problems as do students in other Caribbean countries like Mexico. Our students DO NOT have to leave the country after 1 month and can stay up to 3 months, which is a very good option when you want to extend your stay, get the best out of you training, and make your diving internship longer, more complete and get better prepared for the real world of diving employment. Our candidates normally find a job on the Island within the first 3 weeks, in high season! To become PADI Instructor check on the following chart (first columns) what your actual certification is. On the second column you will get the cost in US$ to become PADI Instructor. If you are a DIVEMASTER already and you would like to become PADI Open Water Scuba Instructor check our schedule below for 2018 IDC dates. Are you already a Divemaster? Do you an excellent customer service oriented attitude? Please send us an email to check our availability. You are highly advised to pre-book your course/internship as availability may be limited. Please refer to the Coral Point Internship Policy section.